This is a comedic story of a taxi driver named Einstein, who has a converter installed in his home to receive cable TV broadcasts. Cables is one of the unforgettable comic works featuring three leading entertainers in the country - Arik Einstein, Moni Moshonov Zvi Schssel.The year is 1992 and national television controls the single TV channel. The technician named Moshonov, installs the cable explains how to use the 'Universal' remote control and shows the anxious driver, who's standing ready to leave for work, the abundance of programs from around the world which can be reached at the click of a button.The taxi driver who was not interested in the first place was captured by this shpiel, sits down, holding the remote, and is astonished great abundance, and forgets that he is now late for work. Memorable comic scenes from the early years of cable TV include the parody of the Italian films of the 50s, gangster films, westerns, war movies Japanese, MTV, sports announcer, free spitting World Championships, and more...Embedded within the comic scenes of Einstein are songs from a host of other known artists, such as Yehudit Ravitz, Korin Allal, Yehuda Poliker, Yoni Rechter and others.+Review:'This Israeli movie features good Israeli comedy, which resembles somewhat to 'LOOL'. The comedy scenes are combined with some good songs performed by Arik Einstein, one of Israel's top male singers. This movie is actually a parody of Cable TV and foreign TV channels, commercials which appeared on the screen of every home in Israel. You can find jokes about the German channels, Italian movies, Hungarian Curses and a parody of a Western. It was a time when cable TV just arrived to Israel and was a brand new amazing attraction.As an Israeli you must see this movie, but even if you aren't, you should have a look, if you want to have a laugh. 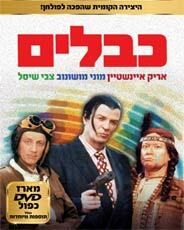 '+Israel Comedy 1992, 98 minsHebrew with Hebrew & English subtitles.